Need it sooner not later? Order it today and you'll receive it around Monday 29/04/19. See delivery terms. 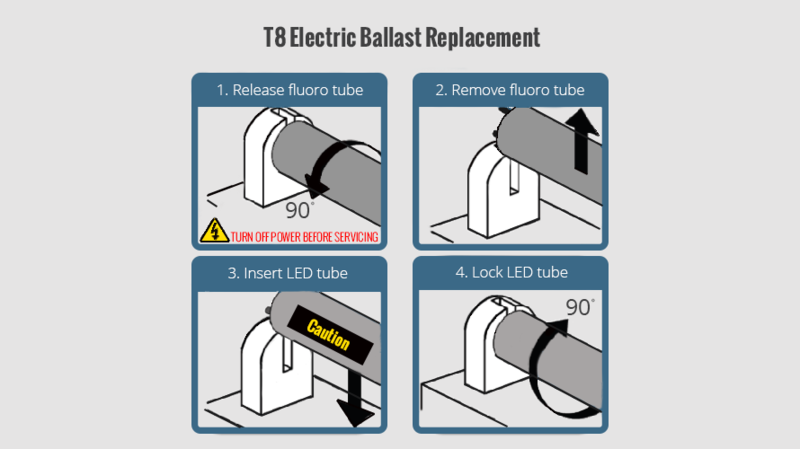 Featuring great energy efficiency, you can easily replace your existing fluorescent tube. The 6ft T8 LED Tube Light - Cool White consumes a modest 25W of power while it produces a stunning lumen level of 2500 - comparable to other commercial lighting. Being LED also means that you will get great life from the unit, with a life expectancy of up to 50,000, at a use of 8 hours a day you can easily get 15 years of life from it! This T8 tube light is also a great quality reaching a Colour Rendering Index (CRI) of 70. This means that anything in the room will appear close to the colour it was meant to be. With a full spread of light coming at a 180° beam angle the light will spread and light up whatever you want it to. This beam angle makes it great for commercial uses such as supermarket shop floors or even in offices. Each 6ft tube light comes with a vibrant and sharp colour of Cool White. This colour is what makes the tube suitable for more commercial use. Cool White is categorised as a 6000K rating on the Kelvin scale. This white output means that it is sometimes called Ice White. We also have shorter lengths to help suit any installation with 2ft, 3ft, 4ft and 5ft tubes available. 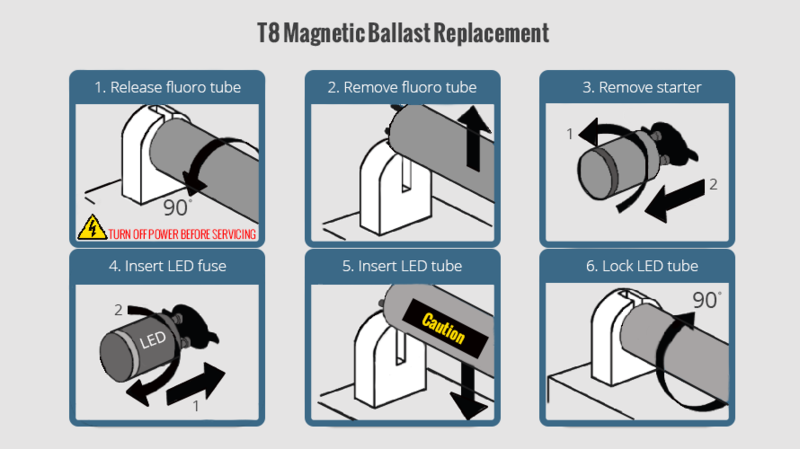 Like all of our other T8 LED tube lights, they replace your existing tube and do not come with the fitting to install them. Replacing them is relatively simple, but you just need to decipher what ballast your current fitting has. To work this out, all you need is a phone with a digital camera, or just a digital camera. All you'll need to do then is fit it into your existing fitting and you'll be good to go! If you are not 100% confident in installing these tube lights then do not attempt to swap them over and consult a qualified electrician as soon as possible. With LEDs becoming brighter and more efficient at an alarming rate, the reasons to switch are becoming more and more apparent. More prominently in CFL light bulbs, you may find that you hear a slight buzzing noise. With LEDs this noise is absent, as well as the irritating flicker when turning your lights on. Once on, they also help you save heaps of cash thanks to their efficiency. With such a low power consumption, LEDs can get the same light output as a lot more inefficient lighting solutions. This is clearly depicted in the heat to light ratio of LED and incandescent lights. In the past, light bulbs have got their light from extreme heat. This heating process causes incandescent bulbs to use a huge 80% of their energy in heat! This remaining, unconvincing 20% of energy is used on light output. By flipping the ratio, LEDs have maximised the efficiency of lighting solutions. With an astonishing 90% of their energy being used as light output and only 10% of the energy used on heat. This astounding ratio is what helps prolong the lifespan to previously unreachable levels. You can even save on the purchase of LEDs as well. With a whole range of discount codes available for you to use, you can bag a great saving! On top of this, you should also know that in case you order several 6ft T8 LED Tube Lights you can benefit from free shipping as every order over £40 does. Each order you place with Wholesale LED Lights comes with a 28 day home trial. This means that if you test your 6ft T8 tube lights and decide you do not like them for whatever reason you can return them for either a full refund or exchange them over to something different. You're also covered against any failures of the unit. Coming with a 2 year replacement warranty, these 6ft T8 tubes can easily be replaced should they unexpectedly fail. Don't be afraid to give us a call on 0116 321 4120 or send an e-mail to cs@wled.co.uk if you have any other questions about the range tube lights or help with installation. Supplied the wrong length first but after changing them out, the fittings were excellent. Change the starter for a fuse they supply and swicth on. Bingo immediate, bright and crisp light. Easy to fit. Brighter than original fluorescent tube. I just wonder if the plastic body will sag given the long length. It’s fine so far but time will tell. No complaints. Works great. Installed easily. Happy customer. Excellent replacement for fluorescent tube. It actually gives a brighter light than the original fitting. Excellent product. Rewiring straight forward. Much better light than fluorescent tubes.